Every fire has a source of ignition, and these ignitions are commonly classified as either lightning- or human-caused (see NICC 2001). The Northern Rockies has been "bombarded" by lightning for millions of years, and cloud-to-ground strikes have ignited fires in the region's forests regularly for millennia (Pyne 1982). Presently, lightning iignites, on average, about 14,000 wildfires and over half of the wildland acreage burned per year in the U.S. (Hildebrand 2003). 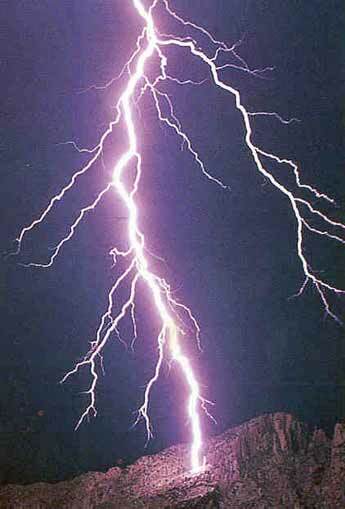 Eighty percent of these lightning-caused fires occur in Rocky Mountain and Pacific Coast states (Barnes et al. 1998), where dry thunderstorms are common (Pyne 2001). Humans have been a source of forest-fire ignitions in the Northern Rockies for at least 6,000 years (Malouf 1969, Baker 2001). Native Americans undoubtedly shaped fire patterns in the region to some degree (Barrett 1981, Barrett and Arno 1982, Arno 1985, Gruell 1985). These influences were surely most pronounced in (and possibly limited to) the low-elevation, dry montane forests (Barrett and Arno 1982). It was probably not until the 19th century and the advent of Anglo-European settlement that the annual number of human-set fires began to approach that of lightning-caused fires in the country as a whole (Pyne 1982, 2001). According to Pyne (2001) many human-caused "fires erupted because wholesale clearing by homesteaders, ranchers, and farmers littered the landscape with combustibles." These combustibles were easily ignited by sparks and embers from trains or, in some rather noteworthy cases, the mischievous indigent (Pyne 1982). It is rumored that drifters and others in want of work as firefighters ignited 75% of the infamous fires of 1910 (Pyne 1982). Today, the average annual number of human-caused wildland fires in the U.S. is nearly ten times that of lightning-caused fires (Hildebrand 2003). While the difference in these statistics is less dramatic for the Northern Rockies alone, humans are still presently the prime source of wildland fires in our region. In 2001, for example, 63% of the 2,842 wildfires in Montana and northern Idaho were human-caused (NICC 2001). In 2002, 60% of the 2,795 wildfires in the same area were human-caused (NICC 2002). Still, lightning is the primary source of ignitions in wilderness and other remote natural areas of the Northern Rockies. For example, the area within the Selkirk and Cabinet-Yaak Grizzly Bear Recovery Zones (within the Kootenai, Idaho Panhandle, and Lolo National Forests) averaged 106 fires and 5,293 acres burned annually from 1985 to 2000. Lightning was responsible for 72% of these fires and 76% of this acreage (IGBC 2002). In general, human-caused fires, are more quickly reported, accessed, and extinguished than are lightning-caused fires. For this reason, the average annual acreage burned by human-caused wildfires in the Northern Rockies (and the U.S. as a whole) is usually comparable to or less than that burned by lightning-caused fires, despite the former being far greater in number (Hildebrand 2003). Arno, S. F. 1985. Fire history in the vicinity of Mary's Frog Pond, Lolo National Forest. Unpub. rept. on file at USDA For. Serv. Intermt. Exper. Sta., Intermt. Fire Sci. Lab., Missoula MT. 2 p.
Barnes, B. V., D. R. Zak, S. R. Denton, and S. H. Spurr. 1998. Forest Ecology, 4th ed. John Wiley and Sons, New York, New York, USA. Barrett, S. W. 1981. Relationship of Indian caused fires to the ecology of western Montana forests. Thesis. The University of Montana, Missoula. Barrett, S. W., and S. F. Arno. 1982. Indian fires as an ecological influence in the Northern Rockies. Journal of Forestry 80:647-651.
Cooper, S. V., K. E. Neiman, R. Steele, and D.W. Roberts. 1987. Forest habitat types of northern Idaho: a second approximation. USDA Forest Service, Intermountain Research Station General Technical Report INT-236. Gruell, G. E. 1985. Indian fires in the interior West: A widespread influence. Pp. 68-74 in J. E. Lotan, B. M. Kilgore, W. C. Fischer, R. W. Mutch, technical coordinators, Proceedings - symposium and workshop on wilderness fire. USDA Forest Service, Intermountain Forest and Range Experiment Station, General Technical Report, INT-182. Hildebrand, D. 2003. Lightning tracking an important tool in land management and wildland fire suppression. Vaisala News 162:32-33. Available online at: http://www.vaisala.com/DynaGen_Attachments/Att27112/VN162_p32_33.pdf.pdf. Malouf, C. 1969. The coniferous forests and their uses in the northern Rocky Mountains through 9,000 years of prehistory. Pp. 271-280 in: Proceedings, 1968 Symposium, Coniferous Forests of the Northern Rocky Mountains. University of Montana, Center for Natural Resources, Missoula, Montana, USA. National Interagency Coordination Center: 2002 Statistics and Summary. Available online at http://www.nifc.gov/news/2002_StatsSumm/incident_support.pdf. National Interagency Fire Center. 2001. National Interagency Coordination Center: 2001 Statistics and Summary. Available online at http://www.nifc.gov/news/2001_Stats_Summ/Intro-Intell_PredServ.pdf. Pyne, S. J. 2001. The fires this time, and next. Science 294:1005-1006. Available online at http://www.sciencemag.org/cgi/reprint/294/5544/1005.pdf.